In 1935, Sinclair Lewis wrote a less-than-successful novel, "It can't happen here" about how a fascist government overtook the United States. 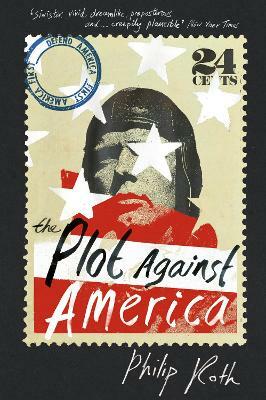 Philip Roth's 2004 novel, "The Plot Against America" seems to me a book in the tradition of Lewis's and other attempts to write novels of alternative history. I found Roth's book, gripping in places as it follows through on its premise. And on a smaller scale, the book offered a good portrayal of Jewish life in Northeast America in 1940s. The book offers a chilling picture of what might happen in any human society overtaken by fear and demagoguery. But for all its virtues, I found the book largely unconvincing. The story is told by a narrator we are intended to think is the author -- named Philip Roth -- who, at the time book begins is 7 years old in living in Weewauken, New Jersey. His brother, Sandy, age 12 shows the makings of a talented artist and his parents are decent, hard-working people striving to arrive in America's middle class. There is much in this book about growing up Jewish in America and about Roth's and many people's ambivalences. Thus,early in the book Philip says: "It was work that identified and distinguished our neighbors for me far more than religion... The adults were no longer observant in the outward, recognizable ways, if they were observant at all." The premise of the book is that aviation hero Charles Lindbergh captures the Republican nomination for President in 1940 and defeats President Roosevelt to become the thirty-third President of the United States. Lindbergh pursues a policy of keeping the United States out of WW II and by showing sympathy to Hitler and Nazi Germany. His vice-President is the isolationist Senator Burton Wheeler of Montana, and Henry Ford is Secretary of the Department of the Interior, which is implementing programs to move Jews from their homes, to destroy their communities, and to assimilate them into American life. There is an important episode in the book in which Roth's brother Sandy goes to live with a tobacco farmer in Danville, Kentucky as part of a Lindbergh administration program to weaken ties of Jewish young people to their community. Paradoxically, Sandy is well treated in Kentucky, becomes close to the Kentucky family, enjoys his experience of farm life, and learns something valuable in broadening his outlook and his understanding of people with a background different from his. There was a substantial undercurrent of anti-semitism in the United States of the 1940s. Roth captures it well in his story and in the notes he appends to his novel. But the burden of writing a counter-factual story -- what didn't happen -- is too strong for this book. The Republicans nominated Wendell Willkie to run for president -- a highly responsible choice and no fascist. Lindbergh did not run for President, and the United States did not turn to fascism. This book is full of laceration, of the families in the book, and of American politics that is painful and largely overdone. For all the difficult times, I resisted most of the themes of the book and came away with a respect for the strength of American democracy. The book also reminded me of the freedom our country offers, as Americans may choose what to believe in the way of religion, or to practice a religion or not practice, as seems proper to them. These are great gifts offered by our country, and Roth's book reminded me of their value, almost in spite of itself. Normally, I pass on fiction but this was a welcome change for me. Even with my conservative views, I enjoyed this. Roosevelt for the time was what America needed with his strong leadership.Popularity swept Lindbergh into the white house and the populous was enthralled..very similar today. This book will keep you up late...highly recommended. Very interesting book from a youngster's POV about what might have happened in America if President Roosevelt had not been re-elected in the 1940 general election. Re-confirmed my progressive outlook toward politics and government.